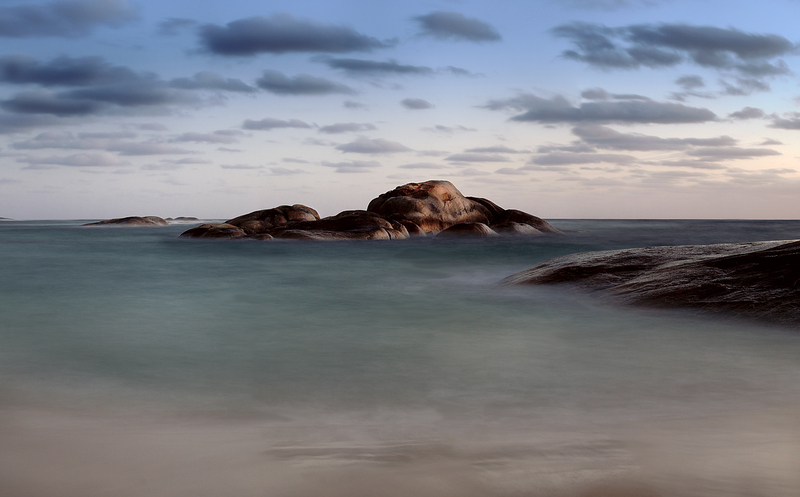 Just next to Greens Pool at William Bay is Elephant rocks on the south coast near Denmark . I’ve been to this spot a couple of times before but never with the camera gear I have now. This was shot in the middle of the day with the 10 stop Singh-Ray Duo filter and is a 3 second exposure. There were quite a few people around so it was hard to get a shot without kids running around , a bit frustrating for me but good fun for them. There was a bit more foreground in this shot but I had to crop it out as the small waves wouldn’t line up at all with a 3 sec exposure. I could probably make it work but I couldn’t be bothered taking the trouble to do it this time . The south coast has a lot to offer photographers and I intend to get down there again as soon as I can. I went to Green Pool one night while we were away , with Pete Hodgson. We met up in Denmark on New Years Eve , left the women with a bottle of vino and went out to William Bay , said we wouldn’t be long and came back 3 hrs later. You know how it is, time just gets away. I’m sure we are the only one’s who went there over the holidays and I don’t think this place has ever been photographed before …… yeah right. I have quite a few different shots of the place and this is one of them. I used the 10 stop vari on this one.